D.14A. Avignon, Marcel Peuch Collection, M 183. PROVENANCE: Freiherr M. von Heyl zu Herrnsheim (Lugt 2879, on verso of mount); on verso of mount, inscriptions in black pencil giving attribution to Frans Floris, and in brown ink: B1 and no. 350 and 39 (crossed out); MP, recto (not in Lugt). D.14B. Paris, Louvre, Inv. 10317. Pen and ink, point of brush and brown wash, traces of black chalk, slightly heightened with white, and lightly squared in black chalk, 23.4 x 19.8; laid down; wm.? Inscribed in ink at the lower left: Giannantonio Regillo da Pordenone (see Lugt, Supplément, 3005c, d), and on the back of the mount: d’après Rosso [Pouncey]. Carroll, 1964 (1976), I, Bk. I, 131-136, 149, Bk. II, 248-249, D.20, II, Bk. III, Fig. 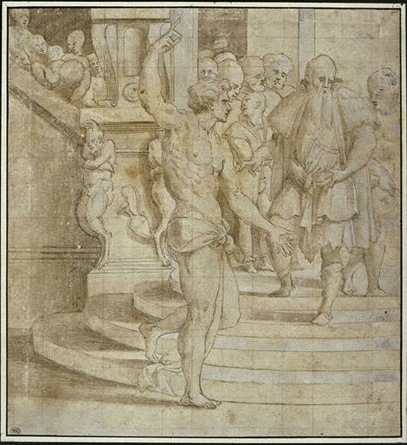 70, as a copy of a lost drawing by Rosso of early 1527. Bettagno, 1966, 27, 103, no. 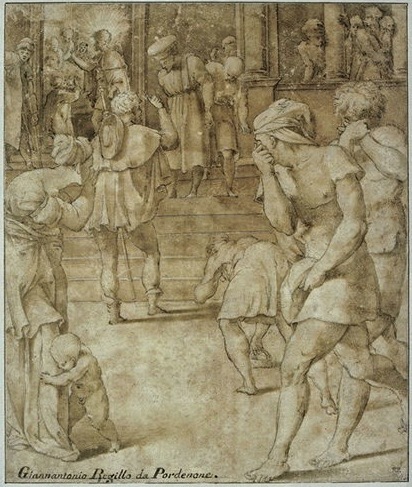 141, under Pordenone, but stating that according to G. Fioco the drawing is by Altobello Meloni; also as representing a scene from the life of St. Roch. Carroll, 1967, 298-99, ns. 9 and 10, as a copy of a lost drawing by Rosso. Béguin, Revue du Louvre, 1969, 151, n. 32, as a copy after Rosso. Saint-Morys, 1987, II, inv. no. 10317, giving Morel d’Arleaux’s (3282) attribution to Pordenone. Franklin, 1994, 155, 285, n. 122, as of uncertain date, may have been produced in France. The Louvre drawing, together with Louvre Inv. no. 10315 (Fig.D.15a) and Louvre Inv. no. 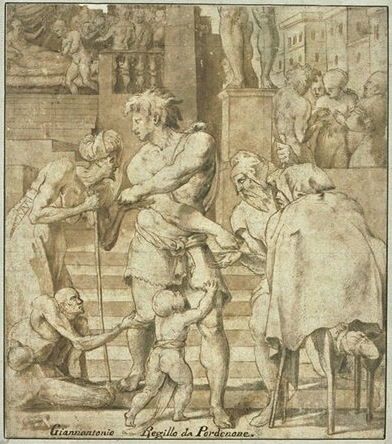 10316 (Fig.D.13 Copy) form a series illustrating scenes from the life of St. Roch, two of which are copied from lost drawings by Rosso, the third from Rosso’s St. Roch Distributing His Inheritance to the Poor in the Louvre (Fig.D.13). All three copies are by the same draughtsman, but not Pordenone as the inscription on this drawing and on Louvre Inv. no. 10316 indicates. But this attribution and Fioco’s to Altobello Meloni indicate the non-Central Italian origin of these copies. The drawing in the Puech colllection is more complete in not being cut on all sides as the Louvre copy is. 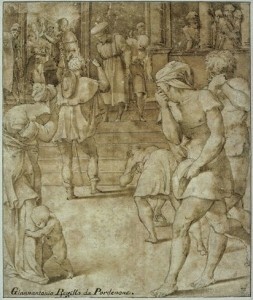 The lost drawing, like Rosso’s original drawing in the Louvre, may also have been executed in red chalk (but see below), and was certainly done at the same time, most likely in the summer of 1524. As Louvre Inv. no. 10316 copies the original drawing very accurately, it may be assumed that Louvre Inv. no. 10317 is also an accurate copy, but in this case of a lost drawing by Rosso. This is supported by the Puech copy which is identical in all respects to the Louvre copy. The size of the Puech drawing is almost exactly the same as that of the red chalk drawing. 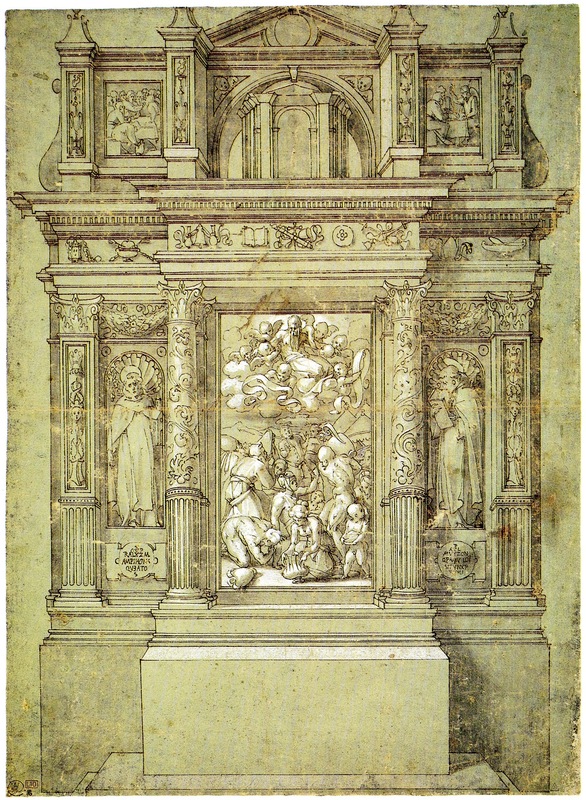 The draughtsmanship of the Puech copy in pen and ink and washes, especially the rows of short pen lines and the stroking of the white highlights, resembles some later drawings by Rosso in the same media, such as the Design for a Chapel of 1529 (Fig.D.37a), suggesting that the media of the lost original was different from those of the original Louvre drawing. 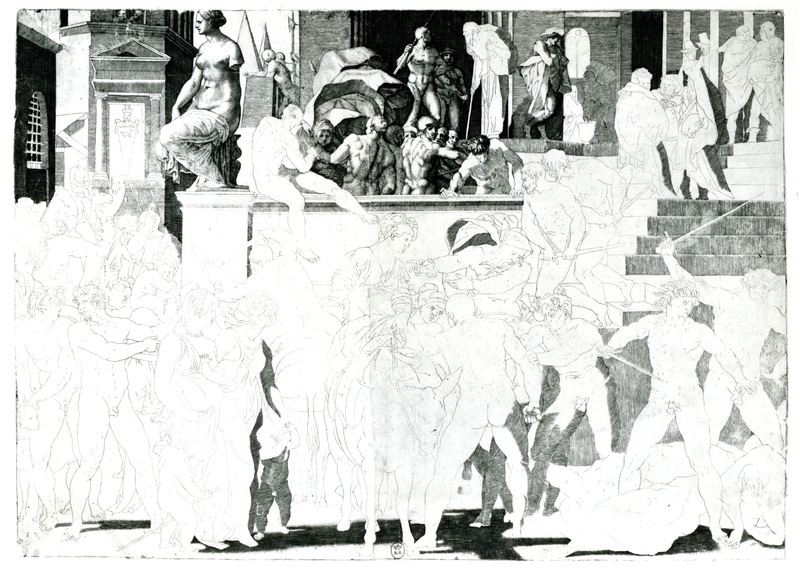 However, the more generalized copies in pen and ink and white wash in the Louvre do not show similar graphic details. It is possible that what appears in the Puech drawing is a very careful translation by the copyist of the red chalk of the original, perhaps with some knowledge of Rosso pen and ink and wash drawings. 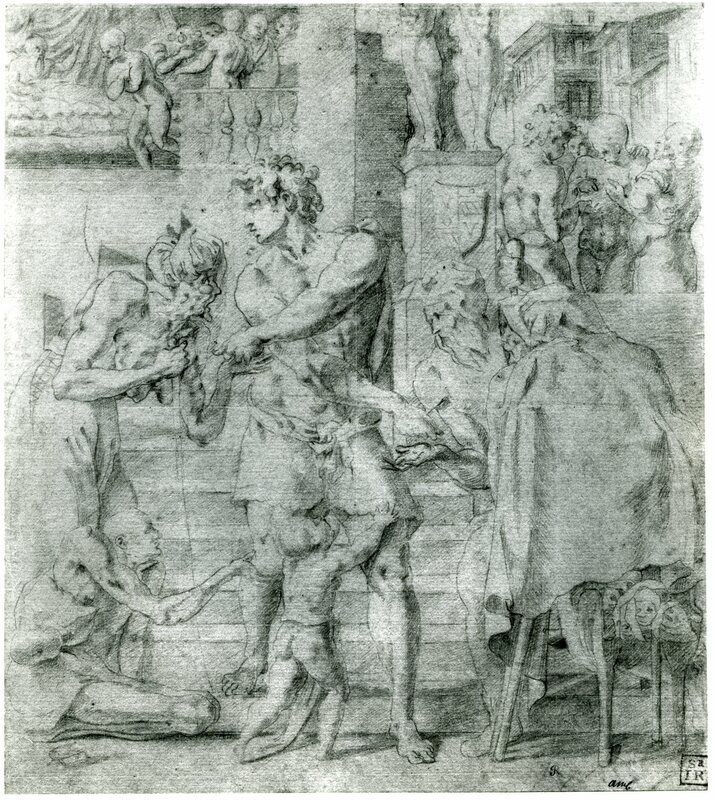 Or it is necessary to conclude that the St. Roch drawings were not all alike and that the Puech copy shows techniques that Rosso was already using in Rome, although no original drawing by him shows him drawing in this manner by this time. Then, too, he may have made two drawings of this composition. 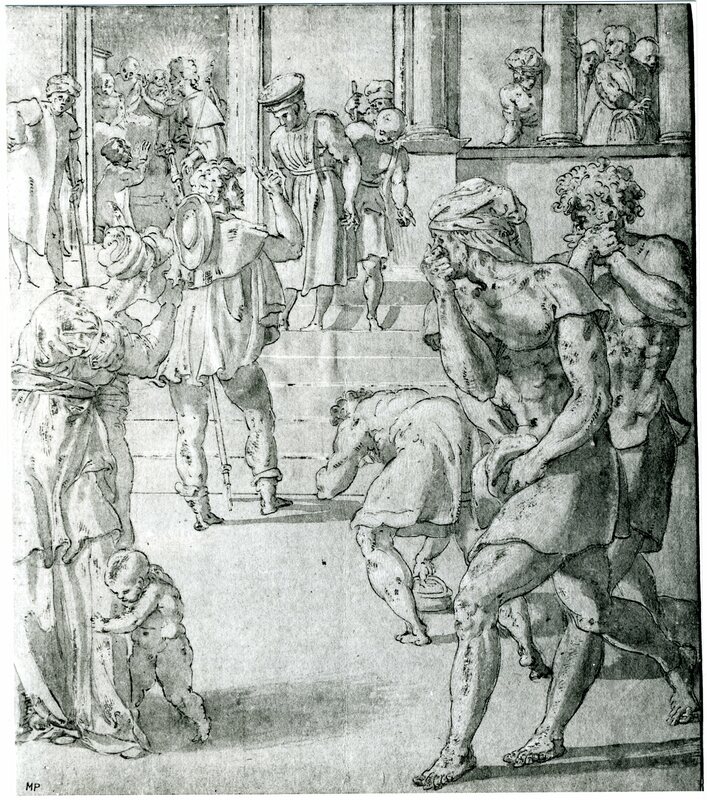 The woman with the child embracing her leg at the left is similar to a group in the left foreground of Rosso’s Battle of the Romans and the Sabines, engraved by Caraglio (Fig.E.48, Paris). 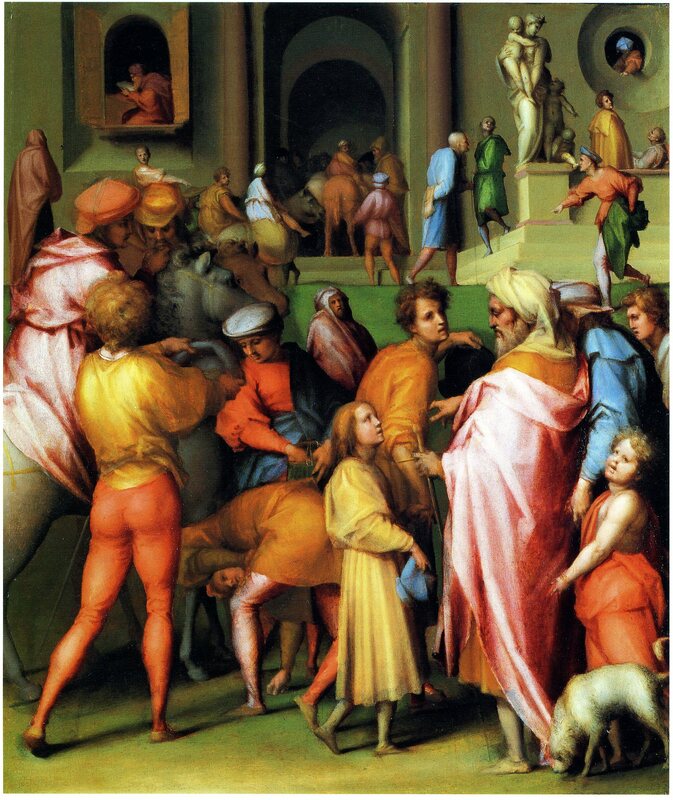 Just to the right of the center is a figure bending over and seen from the rear that is very much like a figure in Pontormo’s Joseph Sold to Potiphar of around 1516 (Fig.Pontormo, Potiphar). On the subject of this drawing, see Voragine, V, 1900, 2-4, and Reau, III, 3, 1959, 1156, 1160. 1For all information on this drawing, and the photograph of it, I wish to thank Marcel Puech, and Sylvie Béguin who brought the drawing to my attention.